Christchurch Borough Council: Pure Town Planning are pleased to announce another successful appeal win for a detached three bedroom dwelling as part of a plot severance in Christchurch. 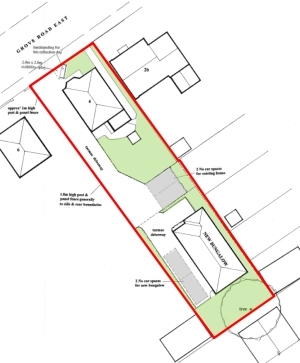 Dating back to 2009, there had been two previous application to sever the site and erect a detached bungalow, utilising the existing access drive off Grove Road East. The applications were refused by Christchurch Borough Council on grounds of inappropriate backland development, being out of character within Grove Road East and being injurious to neighbouring amenities. Both decisions were later dismissed at appeal, echoing the objections of the Council. In 2016, the applicant approached PTP to take the reins and manage a revised proposal. After a lengthy application process, this amended scheme was refused by the Council on similar grounds to the previous applications. Following this refusal, we challenged the decision at appeal. However, in this case the Inspector assessed the submitted evidence and supporting reports and determined that the modest scheme would not be overtly visible in the streetscene and provided sufficient spacing to surrounding properties to avoid any undue harm to neighbouring privacy or amenity. As such, the Inspector was fully satisfied that the proposal respects the character and appearance of the area and safeguards against any inappropriate impacts to neighbours – subsequently allowing the appeal. The client was naturally delighted to hear the good news, which brings a satisfying conclusion following a series of applications and challenges to secure the all-important planning permission. If you have recently had planning permission refused and are considering what to do next, why not contact Pure Town Planning on 01202 585524 or email us at info@puretownplanning.co.uk for an assessment of your chances of success on appeal.